Senior ICE Scotland members discuss the 2017 inquiry into Scottish building failures which showed the need for more supervision on all sites. 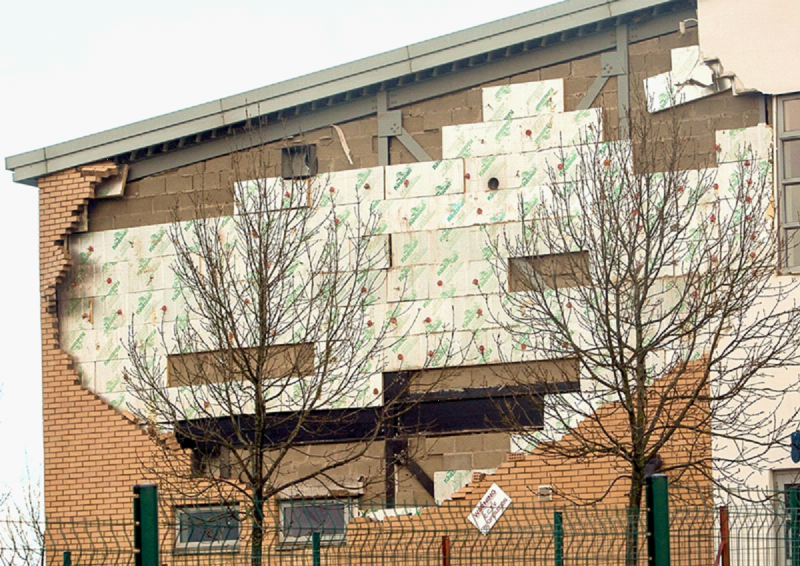 In January 2016 storm Gertrude caused a substantial section of the upper level of an external brickwork facade of Oxgangs School in Edinburgh to collapse onto a pathway below. Fortunately it was early in the morning and the school was deserted. The school and 15 others were built under a public–private partnership (PPP) project for the City of Edinburgh Council and were completed by 2005. Following inspection similar problems were evident over all school buildings in the PPP scheme so all were closed and repaired during 2016. The council commissioned an inquiry led by John Cole (2017). This found a catalogue of construction failures including inadequate tie embedment, varying cavity width, poor wall verticality, missing or inadequate head restraint and missing bed reinforcement issues. Construction had been carried out under a quality assurance regime but there was almost no traditional site inspection undertaken. Lack of as-built records were a further issue. The Scottish government sought industry comment on the inquiry report and ICE Scotland’s response was taken forward by its public voice committee. Subsequently written evidence was also given to the education and skills committee of the Scottish parliament. ICE Scotland found little to disagree with in the inquiry report. It noted that on building projects there are typically multi-disciplinary involvements which can lead to challenges when considering technical supervision, which is sometimes on a visiting basis. In civil engineering this is usually carried out on a full-time basis – and arguably is necessary for managing the contractual process. Experience suggests that supervision, inspection and testing has diminished over the years for financial reasons. Building is a production industry but while other production industries have focused on quality control the building industry typically produces complex and mostly unique products. Basic quality checking has been engineered out in many cases. ICE Scotland considered that in all likelihood the problems identified in Scotland exist elsewhere irrespective of the procurement method. Clients therefore need to adopt appropriate supervision methodologies based on a risk analysis approach – certainly they should not delegate supervision to their contractors. PPP, design-build-finance-operate and design-build contract forms can be adapted to ensure that mandatory supervision is provided in a transparent way. Construction records are an essential part of project completion and should be required prior to facility use. In July 2017 the Scottish government issued interim guidance for site inspection and assurance for public sector clients. Construction Scotland was tasked to advise the government on steps being taken and ICE Scotland is playing its part. Issues being developed include training and verification of brickwork apprentices, technical guidance detailing for masonry, best practice in quality assurance systems, continual professional development training in brickwork detailing and design coordination best practice. It is perhaps hard to believe that these failures occurred in the early 21st century. Project management, programme management and quality assurance systems all have their place but perhaps the construction industry needs to relearn the basics. A project needs to be properly designed and the design needs to be appropriately checked. The design needs to be translated into construction and the construction needs to be independently supervised. Design alterations need to be referred to the designer and adequate as-built records need to be produced. It all sounds very basic – and it is. Ronnie Hunter is ICE council member for Scotland and Jim Young ICE Scotland senior vice chair. They continue their analysis in this month’s ICE flagship journal Civil Engineering.